Data center investor IPI Partners has combined facilities acquired from T5 Data Centers with three sites previously owned by wholesale provider Infomart to create a new brand - Stack Infrastructure - with 100MW of capacity across six US markets. Stack Infrastructure will offer wholesale colocation, along with options for powered shell, and provide new built-to-suit data centers for hyperscale firms. The new company will be run by Brian Cox, previously CEO of Infomart. Stack Infrastructure starts with influential - but secretive - backing. IPI Partners is a joint venture between Iron Point and Iconiq Capital, a venture fund that is described as representing "some of the most prominent names and families in Silicon Valley." In 2014, the investment advisory, led by Divesh Makan, included Facebook's Dustin Moskovitz and Sheryl Sandberg, Twitter's Jack Dorsey and LinkedIn's Reid Hoffman among its backers. In February 2018, Infomart Data Centers sold the Dallas Infomart building (which gave the service provider its name) to its tenant Equinix. In March 2018, IPI took on the remaining three Infomart facilities. It has been widely expected that Infomart Data Centers would change its name, to avoid confusion with the building where it started. IPI Partners had also backed T5 in 2016, helping to finance its facilities in Portland, Oregon and Dallas. In 2018, IPI was reported to be considering divestment of its stake in T5, but this decision was clearly reversed. Instead, complementary assets suitable for the wholesale market have been shifted across to Infomart. This creates a provider with around 1.5 million sq ft (140,000 sq m) of space across six locations: Infomart's facilities in Ashburn, Virginia; Portland, Oregon; and Silicon Valley, California - along with T5's data centers in Atlanta, Georgia; Chicago, Illinois; and two in Dallas/Fort Worth, Texas. The new buildings and even new campuses could appear on development land the company owns in Atlanta, Chicago, Dallas/Fort Worth, Portland, and Silicon Valley. Before Infomart, Brian Cox served as COO at Cologix. The CRO and COO of Stack are also from Infomart: Ty Miller and Donough Roche were appointed earlier in 2018, and previously worked for wholesale giant Digital Realty. The latest executive addition is Rick Waddle, VP of construction and design - a key appointment who joins from Digital Realty, and before that, Dupont Fabros, which Digital bought in 2017. 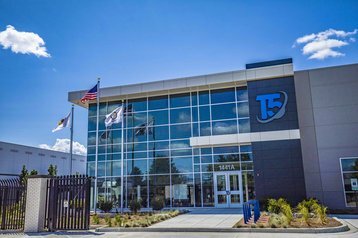 T5, a colocation provider with ten years of history, continues with five data centers listed on its site, located in Los Angeles, Charlotte, Colorado Springs, New York and Cork City in Ireland. Its former facilities in Atlanta, Chicago and Dallas are now described as "previous projects."